Didyma is located near the village of Yenihisar (Yoran) near the town of Söke in the province of Aydın in the Aegean region. Here one finds an important sanctuary that housed one of the oracles of Apollo. It was connected to Miletus by sea, and those arriving by ship would land at the harbour of Panormus and thence follow the Sacred way to Didyma. Until its destruction by the Persians in 494 B.C. it was administered by the family of the Branchidae, the descendants of Bronchos, a youth beloved of Apollo. For the last two kilometers the Sacred Way was lined with seated statues of the male and female members of the Branchidae family. After his capture of Miletus in 334 B. C. Alexander the Great placed the administration of the oracle in the hands of the city of Miletus. In 331 B.C. the oracle proclaimed Alexander "the son of Zeus". In 300 B.C. the Milesians embarked on the construction of the largest temple in the Greek world. Although work continued until the middle of the 2nd century A.D. the temple was never finished. Later, a church and other buildings were constructed, while the Byzantines built a barracks in which troops were garrisoned. The buildings were damaged by fire and in the 15th century further damage was caused by a great earthquake. The Temple of Apollo (Didymaion) was the largest and wealthiest Ionic temple in Anatolia and was renowned for its holy relics, its treasury, its sacred spring and sacred laurel grove. Investigations in the Temple of Apollo were first undertaken in 1834 by the French traveller Charles Texier and the English archaeologist Charles T. Newton, who had conducted the excavations at Halicarnassus. The first excavations were begun in 1904 by Theodor Wiegand under the auspices of the Berlin Museum and continued until 1913. Since 1962 excavations have been conducted by Klaus Tucheld on behalf of the German Archaeological Institute. The first Temple of Apollo was built in the Archaic period and the Hellenistic temple which succeeded this was built on the foundations of the earlier building, materials from which were used in the construction. The temple we see today is an Ionic structure measuring 60 x 118 m, with a dipteral arrangement of two rows of columns with 21 on each side and 10 at each end. The columns are of various styles with pedestals adorned with reliefs. These columns support an architrave surmounted by a frieze decorated with acanthus leaves and Gorgon (Medusa) heads. The high pronaos at the top of a monumental flight of steps leads into a naos with two columns, which gives access to the sacred area or cella in the form of an open courtyard surrounded by high walls with columns and containing a small Ionic temple which housed the statue of the god. Didyma was never a large city and its fame was closely connected with the existence of a sacred spring and the temple founded over it. The ancient Greeks merely took over the already existing sanctuary and reorganised it. 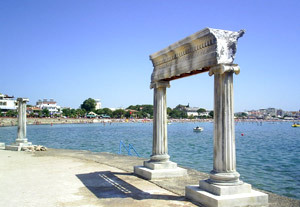 Didyma was connected to Miletus by the Sacred Way, the latter part of which was lined with sarcophagi and statues of lions and sphinxes. The Branchidae family was responsible for the maintenance of the Sacred Way. The remains of the earliest temple, which lie within the later building, have been dated to the 8th and 7th centuries B.C. These consist of a sacred wall measuring approximately 24 x 10 m, an open-air sanctuary, a portico 16 m in length, a sacred well and a votive altar. After traversing the entire length of the Sacred Way, all suppliants to the temple would assemble in front of the building and purify themselves with the water from the sacred well. They were then obliged to pay a certain tax proportionate to the seriousness of their request. For a private affair one had to pay eleven times the standard tax. It was then necessary to sacrifice an animal, frequently a goat, in order to learn whether or not the god was willing to receive the suppliant's request. Before the sacrifice, cold water was thrown over the animal. If the animal showed no reaction the whole process had to be repeated. The suppliant then entered the naos and addressed his question to the priest. If there were a large number of suppliants the next to be received was chosen by lot. The priests then entered the inner temple and communicated the question to the priestess of Apollo who had prepared herself by fasting for several days and purifying herself with water from the holy well. The priestess in the inner sanctuary would drink the water from the sacred well, chew bay leaves and inhale the gases rising from the well. She would then begin to utter apparently meaningless words and sounds, which would be interpreted by the priests, the oracle being written in understandable language in the chresmographeion, or oracle office, a building located immediately adjacent to the pronaos. All the words uttered by the priestess were subsequently communicated to the suppliant by a priest or priests. Legend has it that it was in this way that Alexander the Great learned of his coming victory over the Persians. Oracular divination was the art of foretelling the future through the power of the god mediated by the observation of natural events or objects. Divination in some form or another has been known in all countries in all ages and spread throughout the Western world in the form of astrology. It is popularly known as ``fortune-telling". Oracular divination rests on conclusions drawn on the basis of observation and interpretation. In the case of divination based on observation, recourse is had to the examination of accidental phenomena interpreted by intuition. The soothsayer who examines the intestines of the sacrificial animal, its shoulder-blade or its footprints in ashes was obliged to take special measures to ensure the truth of the oracular pronouncement. The signs chosen for observation by the ancient Greek and Roman soothsayers included lightning, thunder, the night and call of birds and sacred fowls, as well as accidental phenomena such as the spilling of salt, sneezing or stumbling. The term "oracle", which is derived from the Latin "orare", to speak, was used both for the relation between the soothsayer and the god, and the place where the divination was performed. One of the oldest oracles was that of Apollo at Delphi on the skirts of Mt Parnassus at the top of the gulf of Corinth. At first the oracle belonged to Gaia, the goddess of the earth.